Two lovebirds cuddle on a branch glowing with happiness! These two birds make a loving pair with a soft heart-shaped light behind them. 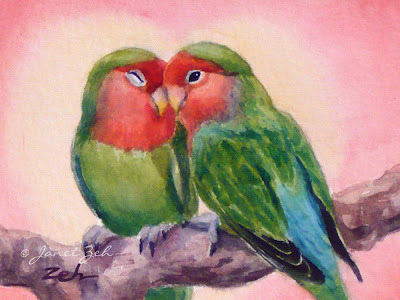 'Happiness Forever' Lovebirds comes in several sizes and can be ordered framed, unframed or on canvas. Click the Order Print button for options and prices.